6U PXI GENASYS System Chassis | Marvin Test Solutions, Inc.
A component of the GENASYS platform, the GX7017 offers the flexibility to incorporate the GENASYS switching subsystem with 3U and 6U PXI instrumentation in one compact, PXI chassis. Based on the 6U PXI architecture, the GX7017 can accommodate up to 9 GENASYS switch cards and 10 PXI modules, with 8 PXI slots supporting the GENASYS GX5960 digital subsystem. Up to 64 external resources can be connected to any of the test system’s switching resources / receiver I/O pins via a high performance, internal 16 wire matrix bus. The GX7017 chassis incorporates the MAC Panel 6U SCOUT receiver. The SCOUT receiver offers a reliable and high performance method to connect the switch modules to a mass interconnect receiver, minimizing the need for cable assemblies. The SCOUT receiver is a “pull-through” design, with each switch card providing a “cable-less” connection to the receiver connectors - eliminating the need for cable harnesses and the associated reliability issues that come with cabled solutions. The result is a system interconnect design that is cost effective, reliable, and maintainable. The modular design of the SCOUT also allows for the use of a broad range of receiver connectors including high density, high current, and coaxial types. The 6U SCOUT receiver can accommodate up to 21 connector slots and over 8000 connections when fully populated. The GX7017 is a 20-slot 6U PXI chassis that can accommodate up to 19 switching or instrument cards as well as a remote PXI bus interface such as the MXI-4. 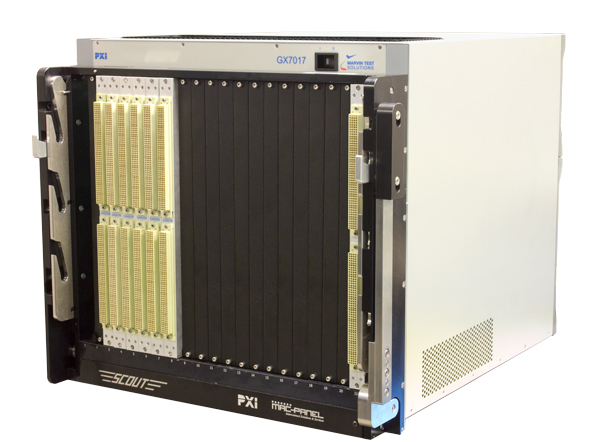 In addition to supporting all of the PXI-1 resources, the GX7017’s PXI backplane provides an internal, high performance, 16 wire, analog bus via the backplane’s P5 connectors. Each of the GENASYS switching cards connects to this internal 16 wire bus, providing the ability to route signals from an external instrument to any of the receiver’s interface connections. System power for the GX7017 includes an 800 W power supply for PXI modules and a supplemental 4.4 KW supply for the digital subsystem's VCC and VEE rails via the J5 connector located on the PXI backplane. The chassis utilizes a Smart power system which automatically adjusts the VCC and VEE voltages based on the programmed drive-high and drive-low levels of the digital instruments, minimizing power dissipation and overall cooling requirements. To ensure adequate cooling, the GX7017’s cooling system includes 8, 100 cfm fans, with four located under the card cage and four located at the rear of the chassis, providing positive airflow per the PXI specification and high capacity cooling for PXI modules. This cooling configuration, in conjunction with air plenums within the chassis, provides airflow for all module slots and requires no additional rack space for inlet or outlet air. Additional cooling with dedicated fans is provided for the system power supplies which are located at the rear of the chassis. The GX7017 chassis supports the monitoring of slot temperatures and system power supply voltages as well providing the ability to program or map each PXI trigger line from one PCI segment to another. In addition, the user can program the temperature monitoring function for specific warning and shutdown limits. All user specific setups can be stored in non-volatile memory as a user configuration and can be used as the default setup for normal chassis operation. The GX7017's Slot 1 is dedicated for the system controller. A PXI Star Trigger controller, any PXI or cPCI instrument or a GENASYS switching module can be used in slot 2. Slots 3-15 support the PXI Star Trigger, or any PXI or cPCI instrument. GENASYS switching cards can be installed in slots 2-10. Slots 11 and 12 can accommodate cPCI or PXI modules and slots 13 - 20 can accommodate the GX5960 GENASYS digital modules or PXI modules. The modular architecture of the GX7017 allows the switching subsystem to support a wide range of configurations and capabilities. Input analog signal routing is supported by the GX6032, a matrix switch module which is located on the rear of the chassis. This module is configured as a 32 x 16 matrix and supports up to 32 inputs which can be connected to the GX7017’s internal 16 wire bus. The chassis can accommodate up to (2) 32 x 16 GX6032 modules. Signal routing from the internal backplane to the receiver interface is supported by any of the GENASYS switch cards which are extended 6U PXI modules with direct connection to the receiver interface. One GX6032 module is supplied with the core system. The GX7017 can accommodate up to (8) GX5961/GX5964 digital subsystem cards, providing a high-performance and compact functional test platform for mixed-signal test applications. The GX5960 offers real-time digital stimulus, record, or expect data modes on all I/O channels. Pattern memory depth is 256K words. Each channel can be configured as an input or output on a per cycle basis. Six drive data formats are supported: NR, R1, R0, RZ, RC, and Complement Surround – providing flexibility to create a variety of bus cycles and waveforms to test board and box level products. The GX7017 is supported by three software packages: GxChassis to monitor and control the chassis and GxSW to control and display the switching connections, and GtDio6x to control and monitor the digital I/O subsystem including the GX5961 and GX5964 boards. The GxChassis Virtual Panel can be used to interactively set /display shutdown and alarm conditions based on defined temperature levels, set the PXI trigger lines and control the fan speed and monitor the power supply voltage. The GxSW Virtual Panel can be used to interactively connect, disconnect and display the switching connections, perform BIT, view relay usage count and more. High level switching software - SwitchEasy allows you to display, control and manage overall signal routing and provides end to end signal routing by having the user simply define the resource and receiver pin or UUT connections, simplifying overall application development and deployment time. Both software packages includes 32/64-bit DLL driver libraries and documentation. The virtual panel can be used to In addition, an API is supplied that supports a variety of programming tools and languages such as ATEasy, Microsoft® Visual Basic, C# and C/++, LabView and LabWindows/CVI and more. Cooling Eight 100 CFM fans for system cooling. Integrated temperature monitoring via an on-board microcontroller with audible and software notification when preset temperature limits are exceeded. Fan speed control and monitoring is automatic and can be controlled / monitored via the GxChassis software.